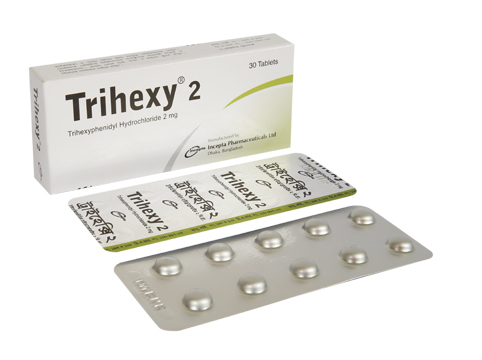 Trihexy 2: Each film coated tablet contains Trihexyphenidyl Hydrochloride USP 2 mg tablet. 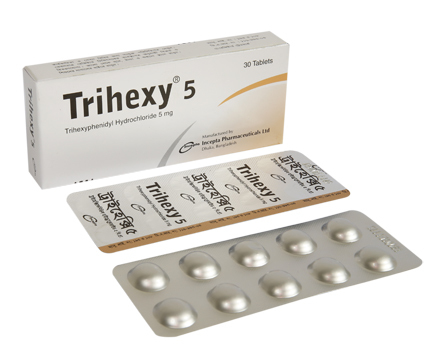 Trihexy 5: Each film coated tablet contains Trihexyphenidyl Hydrochloride USP 5 mg tablet. Trihexyphenidyl exerts a direct inhibitory effect upon the parasympathetic nervous system. It also has a relaxing effect on smooth musculature; exerted both directly upon the muscle tissue itself and indirectly through an inhibitory effect upon the parasympathetic nervous system. Trihexyphenidyl HCl tablets are indicated as an adjunct treatment of all forms of parkinsonism (postencephalitic, arteriosclerotic & idiopathic). Additionally, it is indicated for the control of extrapyramidal disorders caused by central nervous system drugs such as dibenzoxazepines, phenothiazines, thioxanthenes & butyrophenones. Dosage should be individualized. The initial dose should be low and then increased gradually, especially in patients over 60 years of age. Whether Trihexy (trihexyphenidyl HCl) may best be given before or after meals should be determined by the way the patient reacts. 1 mg of Trihexy (trihexyphenidyl HCl) tablet maybe administered the first day. The dose may then be increased by 2mg increments at intervals of three to five days. Commence therapy with a single 1 mg dose increase the total daily dosage to 5-15 mg range if the extrapyramidal manifestations are not controlled. When Trihexy (trihexyphenidyl HCl) is used concomitantly with levodopa, the usual dose is 3-6 mg daily. Minor side effects such as dryness of the mouth, blurring of vision, dizziness, mild nausea or nervousness. Patients with arteriosclerosis or with a history of idiosyncrasy to other drugs may exhibit reactions of mental confusion, agitation, disturbed behavior, or nausea and vomiting. Potential side effects are constipation, drowsiness, urinary hesitancy or retention, pupil dilation, increased intraocular tension, vomiting and headache. Patients with cardiac, liver, or kidney disorders, or with hypertensioon, should closely be monitored. Since trihexyphenidyl has parasympatholytic activity, it should be used with caution in patients with glaucoma, obstructive disease of the gastrointestinal or genitourinary tracts, and in elderly males with possible prostatic hypertrophy. Trihexyphenidyl is not recommended for use in patients with tardive dyskinesia unless they have concomitant Parkinson’s disease. Abrupt withdrawal of treatment for parkinsonism may result in acute exacerbation of parkinsonism symptoms; therefore, abrupt withdrawal should be avoided. Nursing mothers: It is not known whether the drug is excreted in human milk and therefore trihexyphenidyl should only be used if the expected benefit to the mother outweighs the potential risk to the infant.